I've said this before, I'm no amateur to waterfalls. I've seen some big and beautiful falls from Dettifoss and Niagara to Yosemite Falls and Hi'ilawe. So going to Havasupai, I had pretty low expectations. It couldn't beat what I have already seen so far, or so I thought. But, wow, the falls of Havasupai blew my mind and they did so in an incredible fashion. 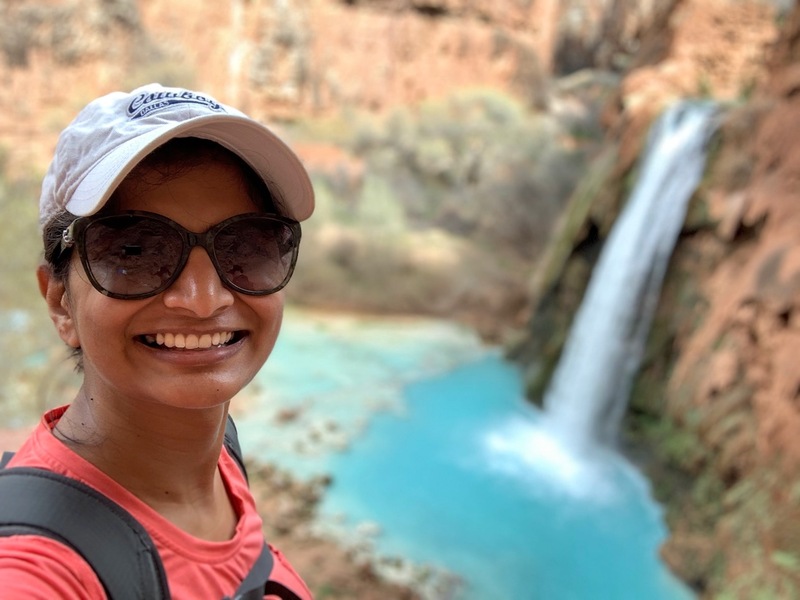 Firstly, because getting to Havasupai is challenge in itself, anything you see post a difficult hike makes it a lot more sweeter and memorable. Secondly, no other falls can compare to the blue color of the Havasupai Falls. None. The closest you could come is if there's a direct waterfall from a glacier with a drop of atleast 100 ft forming a pool at the bottom -- it may have a similar color. But there's no such glacier falls that I'm aware of. Do you know any? These falls are incredible, and I'll try to do them some justice. Let's go through each waterfall in the order in which they appear, shall we? These are the first falls you'll see on the way to the campground, and since you cannot see them in their entirety from the trail, you'll likely come back to see them. 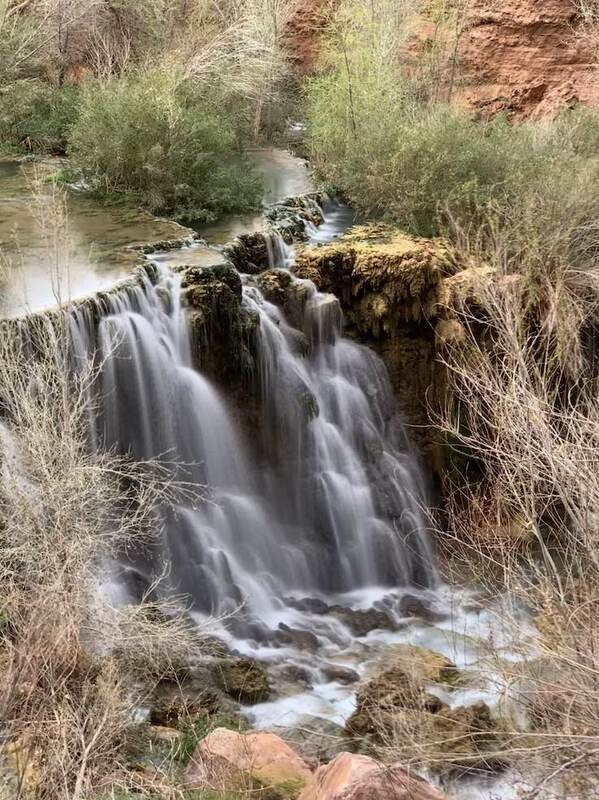 Don't make the mistake of skipping them, because they are the largest falls in Havasupai. There are actually multiple falls (three at least, maybe four/five as well) that make up the Little Navajo Falls, and it's not until you get close to them do you realize that they're pretty tall too. 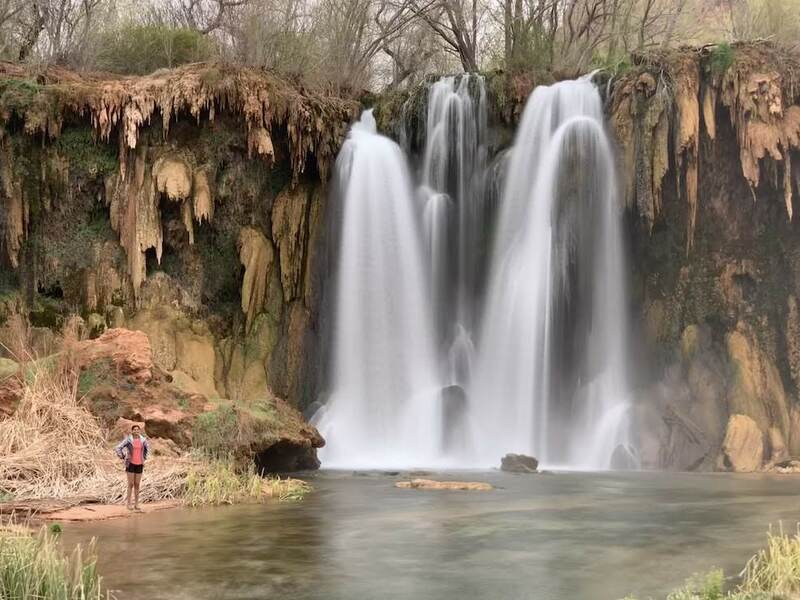 I'll admit the water in these falls is less blue than the Havasu, Mooney or Beaver Falls (atleast when we we there) -- but the falls themselves are definitely as pretty! The sun's rays warm up the water around these falls, so they're definitely better for taking a dip in colder months. We had these falls all to ourselves for a long time, so if you prefer less crowded areas - this one is your best bet. There are some marshy areas around these falls, so tread carefully. The mosquitoes around these marshes may be annoying during the summer months, so carry a bug spray if you have sensitive skin. 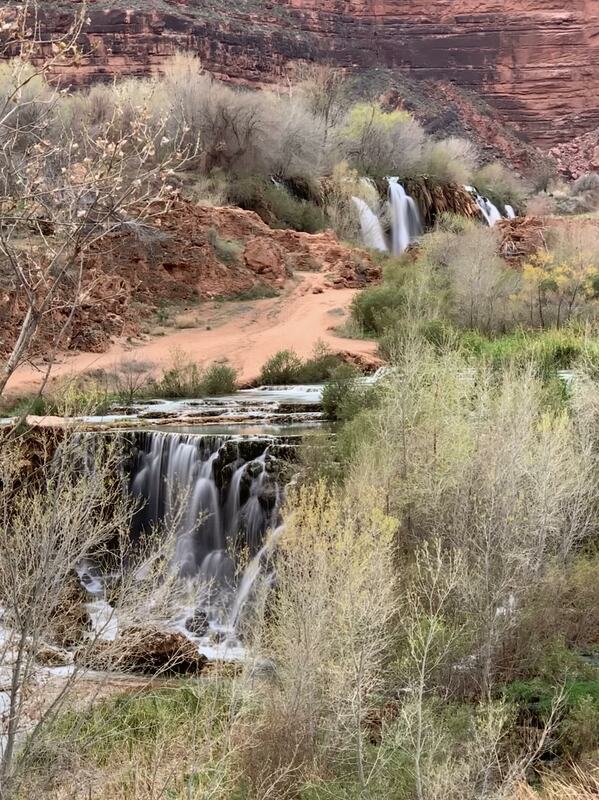 These were the only falls at Havasupai that we couldn't see as well as we wanted. The trail to the base of these falls seemed closed, because the cliff (?) from where you could walk down-hill looked like it had slipped in a land-slide. We saw a couple of folks still taking the same path, but we opted for safety, since we weren't going to take a dip anyway. From up above though, the falls looked pretty. I heard there's a path to go behind these falls, so if the trail to go to the base of these falls is ever restored - go check that out! 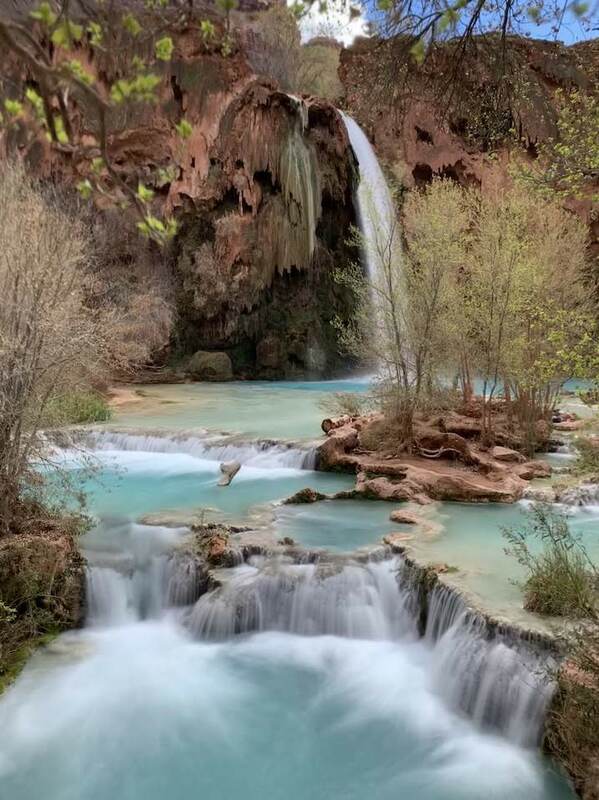 The most famous of all the falls in Havasupai, and the most easily accessible. These falls are literally enroute to the campground, and you cannot avoid seeing them before going to camp. This is a simple single drop fall, slightly turned to the right, forming a bright blue pool at it's base. The white falls and blue pool form a beautiful contrast to the red sandstone and the green moss behind the falls. It's just perfect. There are benches and tree stumps in front of the falls where you can sit and watch the falls to your heart's content. Or you can choose to get a dip in the refreshing cool blue water. The water is supposed to be 70 degrees year-round, but it felt like freezing to me in early March. Your mileage may vary, but I came out of the water shivering. It did make me feel warm for the rest of the day though, so I recommend getting a dip! There are some small pool-like areas to the left of the falls where the sun rays hit in the morning, which is ideal to relax in the water. We never saw these falls empty, but again, it was never too crowded. We could easily get pictures in front of the falls without getting photo-bombed. We went in March which is not the high season -- so your experience may be different depending on the time of year/day you go. That's it for the first part of the Falls of Havasupai. In the second part, I'll cover Mooney Falls and Beaver Falls. What were the most beautiful waterfalls you've seen? Why did you like them?